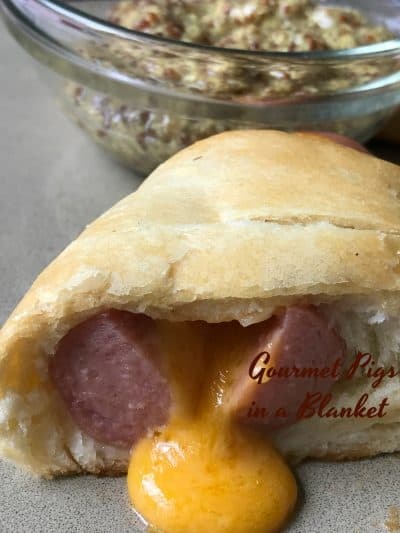 Gourmet Pigs in a Blanket are made with gourmet hot dogs from Omaha Steaks, Pillsbury Crescent Rolls and extra sharp cheddar cheese. 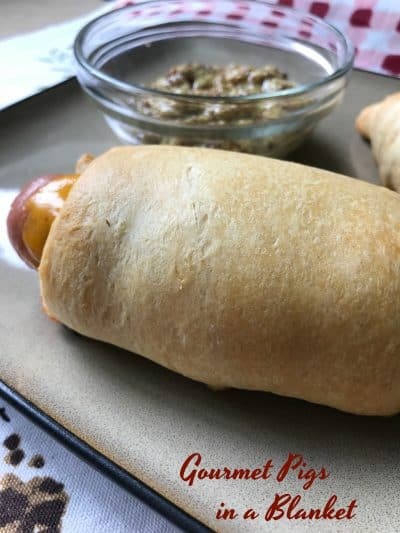 When I made Crescent Dogs (as we called them) years ago, I simply made them with Oscar Meyer hot dogs, Pillsbury Crescent Rolls and American cheese slices. 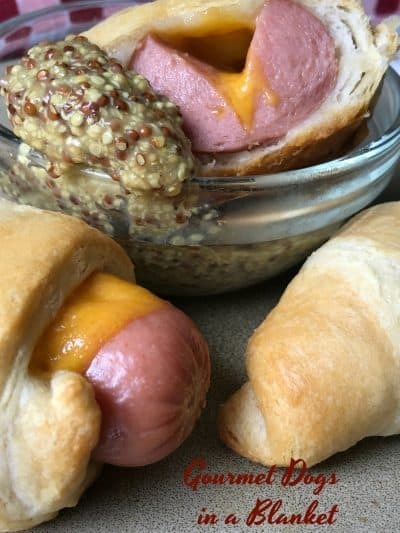 I’m not really sure where, when or how the recipe for crescent dogs came about but I’m pretty sure it’s one of the easiest! The original crescent dog recipe calls for using one 8-oz can of crescent rolls, separated at the perforated edges into 8 triangles. A small pocket is cut into the hot dogs and eight small slices of American cheese is inserted into the pocket. The hot dogs are rolled up in the crescent rolls, baked cheese side up until golden brown. The original recipe can easily serve 4 kids, 2 dogs a piece or 8 kids, 1 dog a piece. Round out the meal with potato chips, apple slices and cookies. For this recipe, the crescent rolls aren’t separated into triangles. The crescent rolls are divided into 4 rectangles. The seams or perforated edges are pressed together to make four large “buns.” Only four “gourmet” dogs are used and filled with extra sharp cheddar cheese logs. The filled dogs are rolled up in the crescent squares, baked cheese side up until golden brown. Serve with your favorite stone-ground mustard and dill pickle spears. Here at Turnips 2 Tangerines we like a good dog recipe just as much as the next guy and here are a few of our favorites. Mini Corn Dogs and Homemade Corn Dogs. In the United States, the term “pigs in a blanket” refers to hot dogs in croissant or crescent rolls, but may include sausages, cocktail wieners or breakfast link sausages baked inside biscuit dough, crescent or croissant dough. 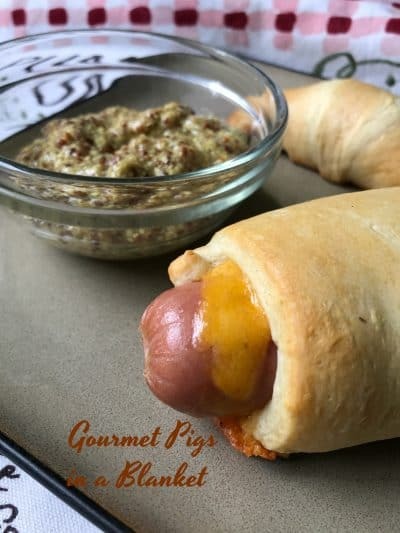 Gourmet Pigs in a Blanket are basically extra thick hot dogs, stuffed with extra sharp cheddar cheese and wrapped with two crescent rolls that have been pressed together to make one big "roll" or "bun"
In medium saucepan, boil hot dogs in boiling water for 2-4 minutes. Remove hot dogs from water and set aside. When hot dogs are cool enough to handle, wipe off with paper towels. Slit hot dogs to within 1/2 inch of ends to form a pocket. Insert 1 cheese log into each slit. *Use two crescent rolls per hot dog. Do not separate dough into triangles. Instead, form dough into 4 rectangles, pressing together at perforations to form into 4 rectangles. Wrap dough around each cheese filled hot dog. Place on ungreased cookie sheet, cheese side up. Bake 12-15 mins or until rolls are golden brown and cheese has melted. Serve with your choice of mustard, ketchup or barbecue sauce. Ingredients used in this recipe are: Gourmet Hot Dogs from Omaha Steaks and Pillsbury Crescent Rolls Use your favorite brand of extra sharp cheddar cheese and serve with your favorite brand of stone-ground mustard.